When I first decided to stop relaxing my hair, I had no idea what I was going to do. So I did what I usually do when I want to find things out, I scoured the internet. Lo and behold, there was this massive world of natural hair bloggers and vloggers, that I never knew existed all over the place with really useful basic and advanced tips on how to care for natural black hair. Thing is, the majority of them were based in the States. 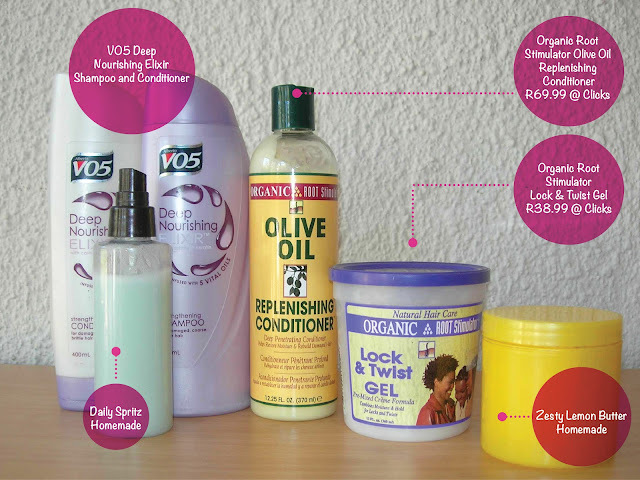 And although they saved my life in terms of what to do with my hair, they were using all of these fabulous products that I couldn’t find ANYWHERE here, in Johannesburg. some dodgy ingredients like petroleum. products. Not to say that I’ve stopped experimenting, my curiosity still leads me to try new things. And my fro is forever changing its mind about what works for it and what doesn’t. But if those new products fail, I go back to old faithful. 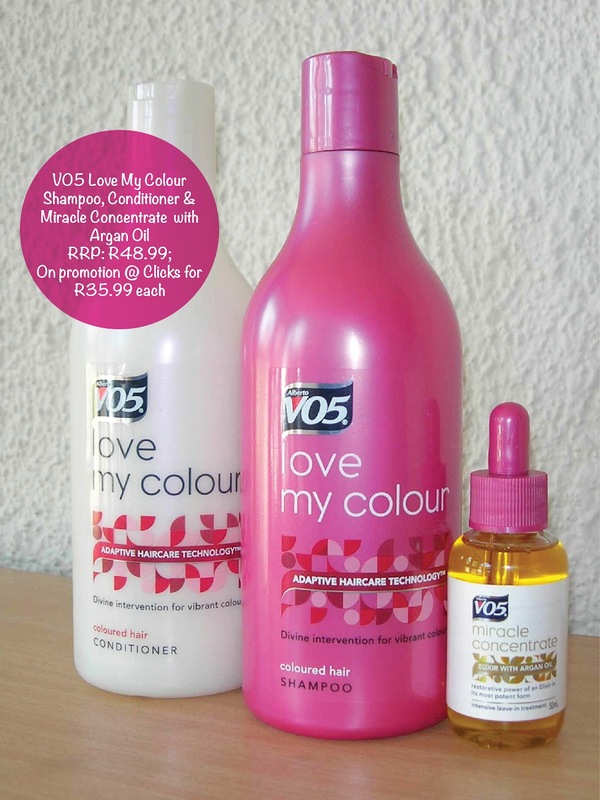 I got the VO5 on promotion at Clicks two months ago for R15 each! I think they may have discontinued them now because I haven’t seen them since and VO5 have released a new range. I spritz my Daily Spritz on as a leave-in conditioner and massage lemon butter onto my hair. I braid about 10-15 chunky braids while my hair’s damp to stretch it. moisturised. I also massage my Zesty Lemon Butter onto my scalp after undoing the braids/twists in the mornings. I don’t use a comb during the week, I only finger comb. A day after I’ve washed, my hair’s stretched enough to braid 8-10 chunky braids or 5 flat twists. If the weather’s not kind, I wash my hair with just conditioner (“co-wash”) and it doesn’t dry my hair as much as shampooing. I usually do this during winter. Results so far: My hair feels soft, detangled and stretchy. I also don’t suffer from itchiness and usually only start experiencing dry hair/scalp after about 10 days. For the exact measurements, please see my products page. 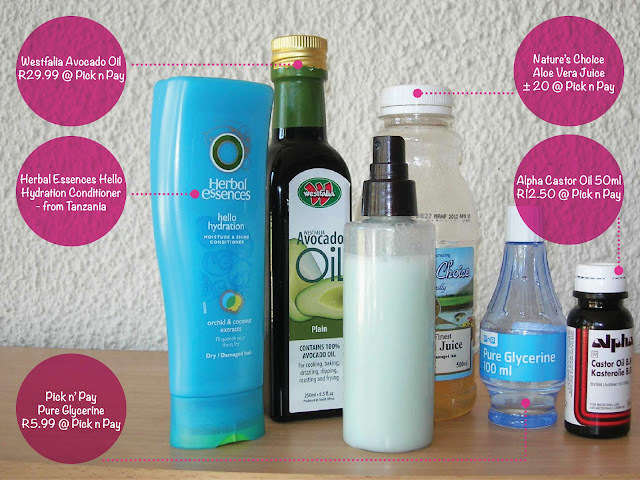 I mix them all into my re-purposed 150ml spray bottle and that usually lasts me a week. Herbal Essences doesn’t seem to be available in SA, but you can use your conditioner of choice in its stead. I love it because of the smell so I stack up on my stock when my sister sends it to me from Tanzania. For the exact measurements, please see my products page. I add the juice and oil to my Tresemme shampoo to give it more moisture and my hair doesn’t come out dry and squeaky clean. Instead, it’s soft and spongey, just the way I like it. I alternate with the VO5 Elixirs shampoo. 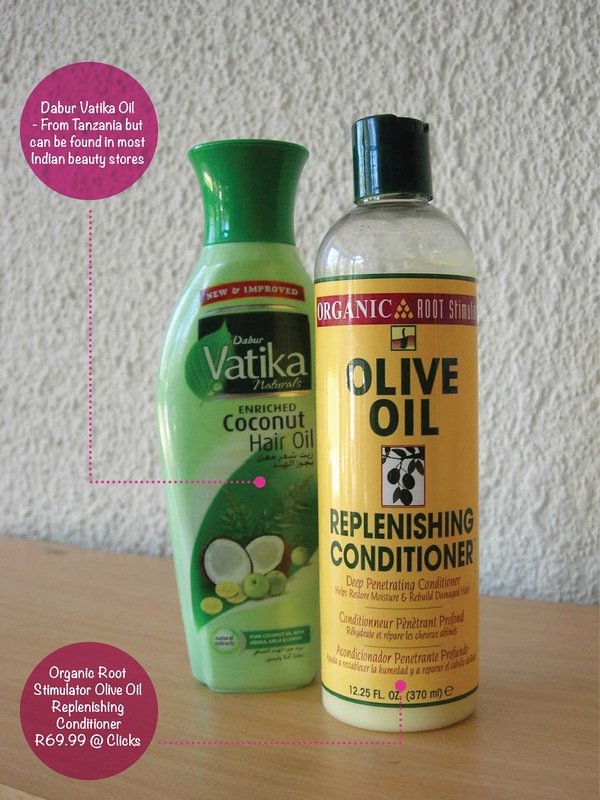 I add about a tablespoon of Vatika oil to my ORS conditioner into a bowl and slap that on for a double deep condition and hot oil treatment. I used to cover my hair with a shower cap but my hair has grown, so I use a plastic bag. Yes, a normal grocery plastic bag. Does the job even better than a shower cap. I’ve gotten over the embarrassment. Okay, The main reason why I bought these was because of the packaging! They’re just tooooo cute. But also now that I have colour in my hair, it made sense to try a range to keep that colour intact. Plus, I’m currently using VO5’s other line and I’m loving it so I figured they should be cool to use. I’ll be doing a review on them once I get onto using them. hi,thanks for your helpful info.which one of the mentioned conditioner do you use as a leave-in conditioner? Hi Cosmo, can i use the products on my loks? what about a hair liner..can you recommend something? I wish to go back to my afro, I had a nice afro but a problem was my hair liner….eish!! 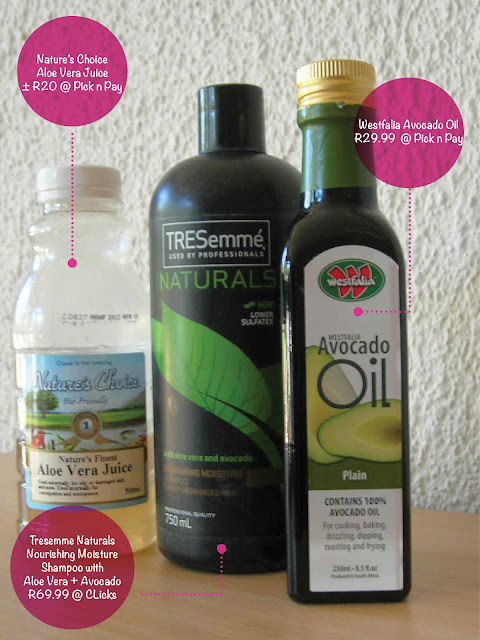 Hi, I'm quite sure you can at least try these products on your dreads. I mean, hair is hair right? So maybe try them and see how it goes for you. I've heard great things about castor oil for thinning hair as it's said to help with hair growth so you can try that on your hairline. Organic Root Stimulator also have a product called "Edge control" but I haven't personally used it yet. Many times thinning hairlines are either hereditary or because your hair's under too much tension (eg. constantly tying it/putting extensions etc.) Hope that helps. Thanks Aisha, I'm gonna use your sprints recipe. I'm too lazy, only use OO and water, off o the store!! Love, love, love this post. I think I might try a couple of your homemade recipes! Thanks Jen 🙂 If you do, please be sure to update me on how it goes for you! Thanks a lot gal for this information, u have made my day.now I can't wait to do my own spritz. I'm so excited. What makes me lough is that I see these igrediants all the time.But never thought that they are the ones I need. I expected different things/ different bottles. Thanks again.